Hardik Pandya dating this ex-Bigg Boss contestant and its Confirmed!! Elli Avram has played the lead actress role in Kapil Sharma’s film.Rumours were coming that Indian cricketer Hardik Pandya is dating ex-Bigg Boss contestant Elli Avram. Well, now it is confirmed that Hardik Pandya is dating a Bollywood actress and she is none other than Elli Avram. Recently few pictures of both of them came out that added the fuel to the fire in the news of their relationship. Earlier people always talked about their relationship but nothing got confirmed. Hardik and Elli fell in love after they met each other for the first time. The report also stated that they started dating when they met at an event over a year back. The ex-Bigg Boss contestant Elli was also recently seen at Hardik’s brother Krunal’s wedding, which was held in December last year. Both Hardik and Elli were also spotted at many other events together earlier. Seems the alleged couple are in no mood to make their relationship official anytime soon. On many occasions, both were spotted together. 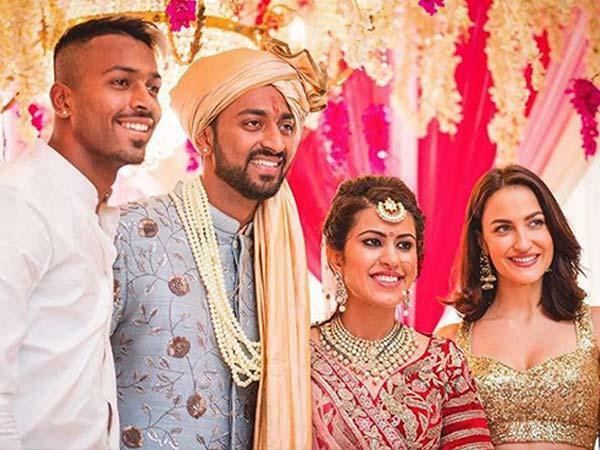 Not only this, even during Krunal’s marriage, Elli was seen very close to Hardik Pandya. This is to notice that Elli and Hardik first met each other during an ad shoot and after that their contact numbers got exchanged. Earlier many tabloids tried to attach Hardik’s name with Bollywood actress Parineeti Chopra but they both always took it in fun. Other Bollywood celebs and Indian cricketers who recently got hitched are Zaheer Khan and Sagarika Ghatge, Yuvraj Singh and Hazel Keech, Harbhajan Singh and Geeta Basra. So guys, what is your opinion on this stylish Jodi? If you have any special comments for this couple then do share your views on the same in below section. PREVIOUS POST Previous post: Check out what’s happening inside ArshiKhan’s party. NEXT POST Next post: Suhana Khan goes from being snappy to smiling in just 5 clicks!